Using the body as a medium of communication, the expression of dance is perhaps the most intricate and developed, yet easily understood art form. Dance in India has seeped into several other realms like poetry, sculpture, architecture, literature, music and theatre. The earliest archaeological evidence is a beautiful statuette of a dancing girl, dated around 6000 B.C. Bharatha’s Natya Shastra (believed to be penned between the second century B.C. and the second century A.D.) is the earliest available treatise on dramaturgy. All forms of Indian classical dances owe allegiance to Natya Shastra, regarded as the fifth Veda. It is said that Brahma, the Creator, created Natya, taking literature from the Rig Veda, song from the Sama Veda, abhinaya or expression from the Yajur Veda and rasa or aesthetic experience from the Atharvana Veda. It also contains deliberations on the different kinds of postures, the mudras or hand formations and their meanings, the kind of emotions and their categorisation, not to mention the kind of attire, the stage, the ornaments and even the audience. All dance forms are thus structured around the nine rasas or emotions, hasya (happiness), krodha (anger), bhibasta (disgust), bhaya (fear),shoka (sorrow), viram (courage), karuna (compassion), adbhuta (wonder) and shanta (serenity). All dance forms follow the same hand gestures or hasta mudras for each of these rasas. The dances differ where the local genius has adapted it to local demands and needs. 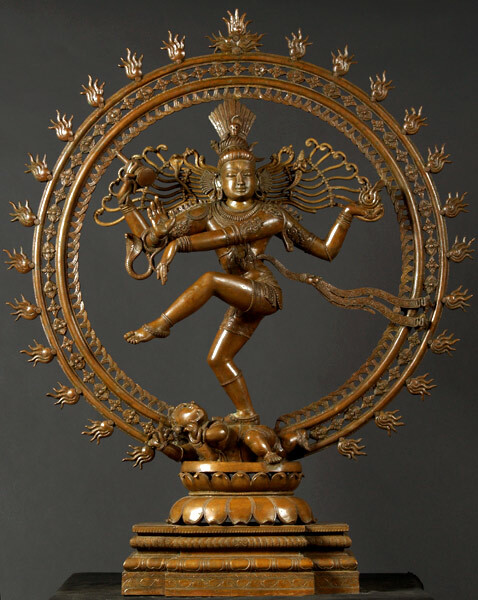 One of the most enduring symbols of India is the figure of Nataraja – Shiva, the King of Dancers . 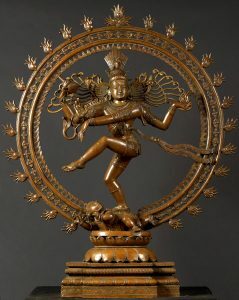 Shiva’s cosmic dance is believed to encompass creation, preservation, and destruction and this idea has been embedded in Hindu thought and ritual since the dawn of civilisation. He holds a small drum (damaru ) in his upper right hand. His lower right hand shows the fear-negating gesture (abhaya ), his upper left hand is in half-moon pose (ardhachandramudra ) which holds a tongue of flame which is the fire (agni ) that finally destroys the world and is then quenched in cosmic waters. Thus the hand holding the drum and the one holding fire balance the forces of creation and destruction. The second left arm is held gracefully across the chest (gajahastamudra ) with the hand pointing to the uplifted foot, denoting favour or grace for the devotee. One foot rests on Apasmara or Mauyalka, the embodiment of human cruelty and ignorance. Surrounding Shiva’s figure and emanating from him is an immense aureole of flames (prabhamandala ) representing the vital processes of nature, sustained by the tremendous energy of the dancing God within. The flames represent the transcendental power of wisdom and truth, as well as the mantra ‘Om’ which signifies the totality of creation. Also known as the Ananda Tandava, this dance is a metaphor for the belief that life is essentially a dynamic balancing of good and bad, where opposites are interdependent. The dance of Shiva is the dance of life. Indian dance is a blend of nritta – the rhythmic elements, nritya – the combination of rhythm with expression and natya – the dramatic element. Nritta is the rhythmic movement of the body in dance . It does not express any emotion. Nritya is usually expressed through the eyes, hands and facial movements. Nritya combined with nritta makes up the usual dance programmes. Nritya comprises abhinaya, depicting rasa (sentiment) and bhava (mood).To appreciate natya or dance drama, one has to understand and appreciate Indian legends. Most Indian dances take their themes from India’s rich mythology and folk legends. Hindu gods and goddesses like Vishnu and Lakshmi, Rama and Sita, Krishna and Radha are all depicted in classical Indian dances. Each dance form also draws inspiration from stories depicting the life, ethics and beliefs of the Indian people. Besides these, there are several semi-classical dances that contribute to the plethora of Indian dances. Apart from the classical dances, India is particularly rich in folk idioms. Each area has its own special varieties, be they martial, seasonal, ritual, sacrificial, celebratory, instructional or talismanic. It can vary from village to village, but they all share a common heritage of myths and symbols. Some of the folk forms of India are Chauu dance of Bihar, Garba of Gujarat and Bhangra of Punjab and Banjara of Andhra Pradesh.